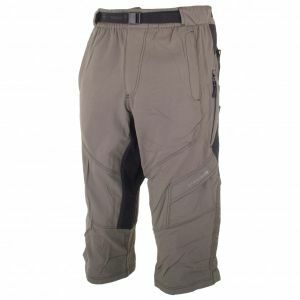 Mountain bike trousers are available in a variety of different styles and designs. MTB trousers with long legs, ¾-length legs, knee-length legs or even shorter, are available in tight-fitting bib designs, in a regular wide fit or in an oversized baggy fit. Selecting the right mountain bike trousers is based on several important factors. Type of use and personal riding style are just as decisive as the weather conditions, season and temperature. High comfort and perfect manoeuvrability are indispensable in all MTB trousers. Baggy or bib - wide or slim bike trousers? The classic, tight-fitting cycling trousers guarantee a low weight and optimal fit. Their integrated seat padding ensures high comfort on long cycling tours. Many mountain bikers, however, prefer the wider-fitting baggy shorts, which look almost like outdoor shorts at first glance. The popular wide-fitting cycling shorts are made of strong, breathable and stretchy functional materials. This makes them more robust and durable on the terrain than the thinner, lightweight bib shorts. Since mountain bikers can make a lot of contact with the ground on narrow trails, freeriding routes or in bike parks, they are often equipped with knee protectors and shin protectors. These are easy to wear underneath baggy trousers, while still offering plenty of freedom of movement when cycling. Leading manufacturers of mountain bike clothing, such as ION, Endura, IXS or Maloja, prioritise a premium finish and high-quality materials. The integrated seat padding in particular is critical. The comfortable pads are usually permanently sewed into most cycling trousers. Baggy shorts are often produced with removable inner pants. This enables the combination of the perfect fit of bib shorts and the loose cut of baggy shorts. They are also easier to clean since the inner pants can be washed separately. Whether it's bib shorts or downhill shorts - the correct position of the seat padding is essential for a comfortable feel. The seat pad can only absorb impacts and vibrations effectively if it sits perfectly on the saddle in the respective riding position. A good MTB saddle and suspension provide additional comfort alongside the MTB trousers.